WALL CLAD is a well known WPC product, widely used for Exterior wall coverings, globally. It has equal use in interior surfaces also. Major application remains with outdoor wall paneling such as villa exteriors, apartment exteriors, hotel exteriors, hospital exteriors, commercial building exteriors, architectural layouts, educational institutions etc. This is an all weather product. 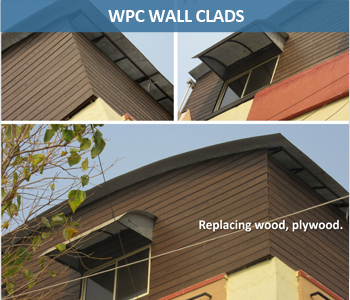 WPC WALL CLAD is a durable, biodegradable and environment friendly product. They can be installed, trimmed and painted with commonly available products and tools. Scraps are biodegradable and can be recycled with other paper products. WALL CLAD gives typical natural touch to overall ambience where it is used. Technically, it reduces sunshine reflection and absorbs UV radiation. Socially, it is a green product that protects environment with its natural characteristics of anti-water, anti-fungus & anti-termite. We at Hardy Smith Designs are Wood Plastic Composite (WPC) manufacturer. We are manufacturing WPC Ply, "WPC High Gloss Marbles", "WPC Deck Floors", "WPC Wall Clads", "Exterior Wall Cladding", "Wall Cladding Tile", "IPE Wood Wall Cladding", "Brown Wall Cladding", "Fundermax Exterior Cladding" and "WPC Applications".